Do you like half-batch recipes? Or would you rather bake a full batch or even a double batch of stuff? I like baking half batches because that means I can bake something else sooner. Besides, if I make a double batch of anything because I intend to freeze some for later - that's the batch that's going to be a disaster. Even if it's something I'm used to making frequently. Making a double batch means that I will forget to add the baking powder, or measure the oil twice, or set the oven to broil instead of to bake. True stories. All of them. So, let's play it safe and make a half batch of cookies! Susan, you made me hungry for blueberries! 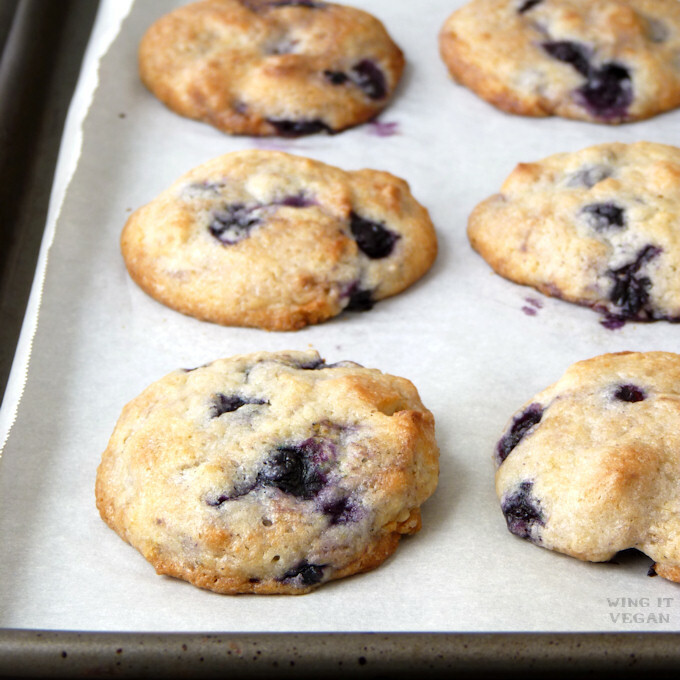 These are soft on the inside and crispy on the outside with lots of chewy almond paste bits and juicy blueberries. 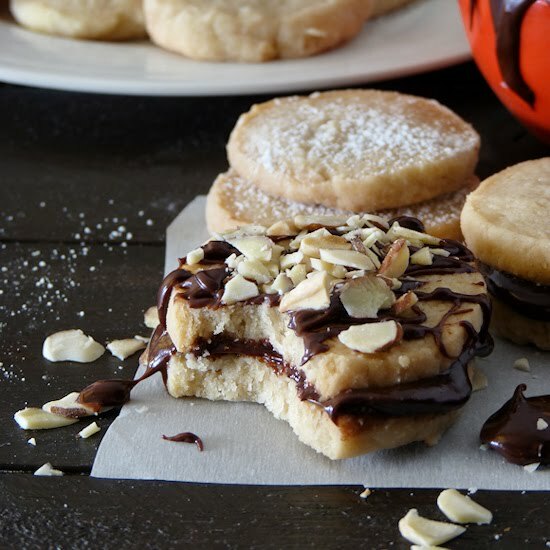 I like to take it easy on the sugar for these because the almond paste adds its own sweetness to these cookies, but they are still sweet because they are cookies. They do have blueberries and nuts (from the almond paste) so they're practically a whole food, right? That is if you don't count the fat, the sugar, the white flour, and the fact that I could probably shove an entire batch in my mouth within minutes. Your Honor, let the record show that I CAN actually bake things without using any chocolate. Preheat the oven to 350 degrees F / 175 C and line a cookie sheet with parchment paper. 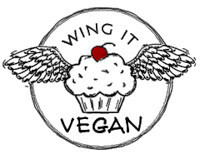 In a small bowl whisk together the chickpea flour, a tablespoon of almond milk, almond extract, vegetable oil, and sugar until smooth and creamy. In a medium sized mixing bowl sift in the flour, cornstarch, baking powder, and salt. Give it all a good stir. 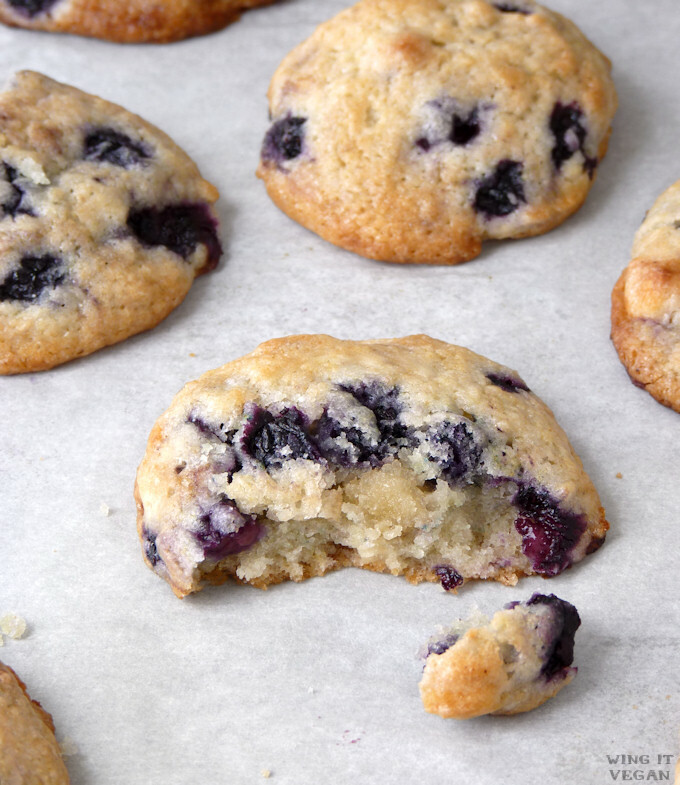 Throw in the almond paste bits and blueberries and toss them around to coat them with flour. Add the liquid ingredients and stir with a large spoon until your cookie dough looks smooth. If it looks dry and crumbly, add milk a teaspoon at a time. The dough needs to be fairly firm but it shouldn't be dry and crumbly. Scoop onto the parchment-lined cookie sheet, about an inch apart. My cookie scoop holds 1.5 tablespoons of cookie dough. Bake for nine or ten minutes, or just until the tops of the cookies don’t look wet anymore, then immediately rotate the cookie sheet to bake them evenly and bake for another two to three minutes. The middle rack of my oven browns their bottoms too much, so I bake mine on the next higher rack. Keep an eye on them after eight minutes because your oven may be faster than mine. Also, I need to broil mine during the last two minutes (still at 350) because my oven refuses to bake from the top. Transfer the cookies to a cooling rack and let them cool down a bit. Really, hot blueberry balls of lava are no fun! If you can, bake a test cookie first. That’s what I do when I’m trying out a new-to-me recipe to make sure I don’t end up with ruined cookies and wasted ingredients. Different people measure things differently, we may use different brands of baking ingredients, and we may live at different altitudes that might alter the cookies. So if possible, bake a test cookie and see how it does in the oven. If it doesn’t melt into a puddle of cookie, go ahead and bake the rest of the batch. If it melts it means you’re going to need to work a little bit more flour into the dough. My oven doesn't like to bake from the top. I have to bake my cookies for seven or eight minutes and then switch to broil, still at 350, for the final two or three minutes. If your oven is an incompetent imbecile like mine, you might want to do the same. Keep an eye on them if you broil them though – Captain Obvious would like to point out that parchment paper is flammable. That's it for the foods. Now let's check on the birds! Mr. Wing-It and I are both very witty when it comes to naming our backyard birds. 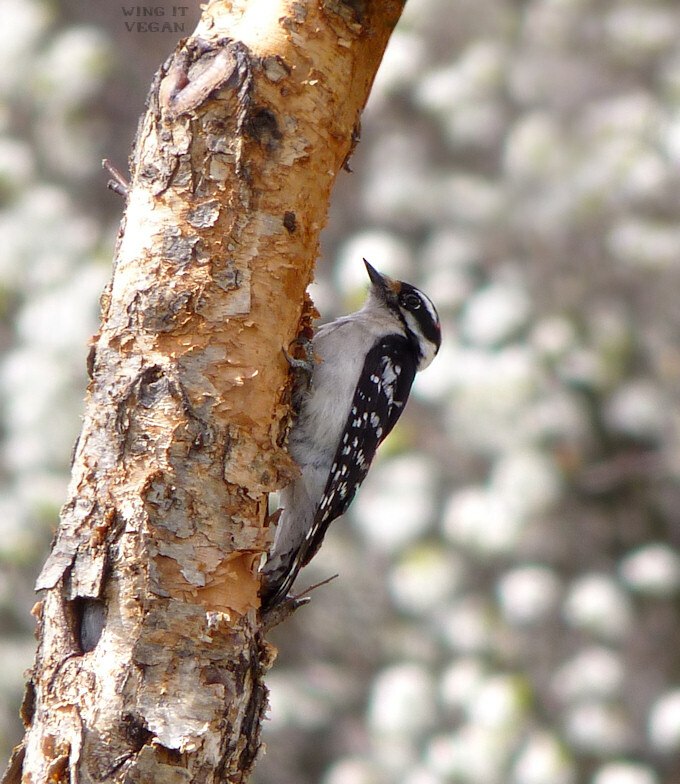 For example, here is one of the downy woodpeckers that visit us every day. His name is Woody. Creative genius! All the other woodpeckers that visit us are also called Woody. those look so good - like the tops of muffins! mmm! Now I have to check out your muffins! Yerr i could eat a whole half batch of these so it's probably safer than a full one! Half batch cookies are the best! I love half batch everything although I really have to concentrate while measuring everything. If I don't write down the halved version I forget a couple of minutes later and then have to make the whole batch anyway because I dumped in too much flour or sugar. I quite enjoy half batches because it means I get to bake more things but don't have to eat an entire batch. Don't get me wrong, I would love to eat an entire batch, but since I have hit my 30s I don't quite have the metabolism of my 20s. Which is sad, because I certainly still have the stomach capacity. ;) It just means I need to do some extra yoga. Hee hee. I have never ever baked a test cookie. I live on the edge. ;) Even if I am making a new recipe for someone coming over or for a bake sale, I just go right ahead. I've had a few disasters, but that is what smooshing things into balls (hee) is for! Don't get me started on the 30s belly! Why? WHY?! I can't say I'm too fond of the mid 30s metabolism. But yes, the stomach capacity is still there! I love love love your recipes! Can't wait to make some!